The conquest of land occurred at least five times convergently within the Crustacea. We are interested in the terrestrial adaptations of the sensory organs and the brain of various terrestrial crustacean taxa in contrast to their nearest marine relatives. In this framework, our main focus lies on the morphology of the central olfactory processing areas. For our research, we use classical histological, light microscopic techniques, X-Ray computed tomography as well as backfills with neuronal tracers, immunofluorescence labeling in combination with confocal laser-scan microscopy and 3D-reconstruction. In addition to the morphological data, our aim is to study the capacities for orientation of e.g. the giant robber crab Birgus latro in field experiments with the aid of behavioral tests as well as radio- and satellite telemetry. In addition to studies on robber crabs, we use different species of Coenobita as comparison model for bioassays in windtunnel experiments focussing on olfactory behavior. These experimental and morphological data will improve our knowledge of terrestrial adaptations and the evolution of crustacean sensory and nervous systems. 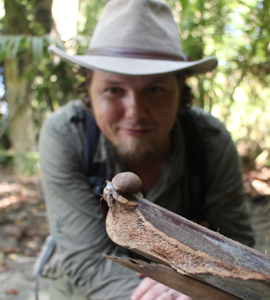 For studying the cognitive capabilities of hermit crabs, we conduct behavioral two-choice experiments on Coenobia compressus using 3D-printed gastropod shells in the lab as well as in the field (Peninsula Osa, Costa Rica). 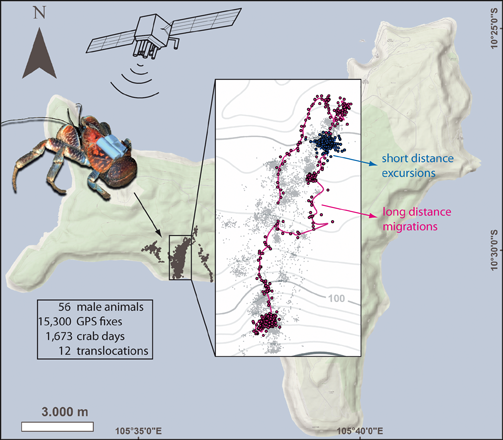 Summary figure for telemetric studies on Christmas Island from 2008 to 2011 shows an animal carrying a GPS transmitter and typical movement patterns (blue and pink paths) out of all waypoints (black dots on background map). Krieger J & Spitzner F (accepted). X-ray microscopy of the larval crustacean brain. In: S. Sprecher (ed.) Brain Development Methods and Protocols, Springer. Harzsch S & Krieger J (2018) Crustacean olfactory systems: a comparative review and a crustacean perspective on insect olfactory systems. Progress in Neurobiology 161:23-60. Download via scienceirect.com. Holst S, Michalik P, Noske M, Krieger J, Sötje S (2016) Potential of X-ray micro-computed tomography for soft-bodied and gelatinous cnidarians with special emphasis on scyphozoan and cubozoan statoliths. Journal of Plankton Research 38 (5): 1225-1242. Download via Oxford Journals. Krieger J (2016) Neuroanatomische und neuroethologische Untersuchungen am größten terrestrischen Gliederfüßer, dem Palmendieb Birgus latro (Linnaeus, 1767) (Crustacea, Anomala), auf der Weihnachtsinsel (Indischer Ozean). Inaugural-Dissertation Universität Greifswald. 157 pp. pdf via OPUS-Datenbank der Universitätsbibliothek Greifswald. Krieger J, Drew MM, Hansson BS, Harzsch S (2016) Notes on the foraging strategies of the Giant Robber Crab Birgus latro (Anomala) on Christmas Island: Evidence for active predation on Red Crabs Gecarcoidea natalis (Brachyura). Zoological Studies 55:6. Open Access. Download additional movie file (.mp4) by using right-click on this link and "save target as...". Krieger J (2018) Hermit housing situation in Costa Rica - Shell choice experiments and olfactory guided behavior of the Pacific hermit crab Coenobita compressus H. Milne-Edwards, 1836 (Malacostraca, Anomala). Institute Symposium of the Zoological Institute and Museum of the University of Greifswald, Germany. López AI, Haug JT, Hörnig MK, Krieger J, Haug C (2017) Convergent evolution of raptorial appendages in arthropods: first steps towards a quantitative approach. 110th Annual Meeting of the German Zoological Society, Bielefeld, Germany. Kirchhoff T, Krieger J, Harzsch S (2014) Vom Wasser an Land: Einblicke in die Postembryonalentwicklung des Palmendiebes Birgus latro (Linnaeus, 1767); 7. Graduiertentreffen Fachgruppe Morphologie der DZG, Hamburg, Germany. Krieger J, Hansson BS, Harzsch S (2014) Crabs on the move - Telemetric analyses of migrations and daily activity of the giant robber crab Birgus latro on Christmas Island (Indian Ocean). 8th International Crustacean Congress, Frankfurt am Main, Germany. Harzsch S, Krieger J, Hansson BS (2014) Terrestrial adaptations of the sense of smell in terrestrial Anomura and Brachyura. 8th International Crustacean Congress, Frankfurt am Main, Germany. Krieger J, Braun P, Harzsch S (2014) Evolution of the central olfactory pathway in terrestrial brachyurans (true crabs) versus terrestrial anomurans (hermit crabs). Rauischholzhausen Seminar: Development and Plasticity of the insect nervous system, Rauischholzhausen, Germany. Krieger J, Grandy R, Drew MM, Erland S, Stensmyr MC, Harzsch S, Hansson BS (2012) Giant Robber Crabs (Birgus latro) monitored from space GPS-based telemetric studies on Christmas Island. 105. Jahrestagung der Deutschen Zoologischen Gesellschaft, Konstanz, Germany. Krieger J, Harzsch S and Hansson BS (2011) GPS– und Radiotelemetrische Untersuchungen zur Migration des Palmendiebes, Birgus latro Linnaeus, 1767 (Crustacea, Decapoda, Anomura) auf der Weihnachtsinsel. 15. Crustaceologen-Tagung, Regensburg, Germany. Krieger J, Sandeman RE, Sandeman DC, Hansson BS and Harzsch S (2010) Brain architecture of the largest living land arthropod, the Giant Robber Crab Birgus latro (Crustacea, Anomura, Coenobitidae): evidence for a prominent central olfactory pathway? EVOLF MMX Conference, Christmas Island, Australia. Krieger J, Seefluth F, Sandeman DC, Sandeman RE, Hansson BS and Harzsch S (2010) Brain architecture of Birgus latro L., 1767 (Crustacea, Decapoda, Anomura) in comparison to other terrestrial and marine decapod crustaceans. 103. Jahrestagung der DZG, Hamburg, Germany. Krieger J (2010) Die Gehirnarchitektur von Birgus latro (Linnaeus, 1767), (Crustacea, Decapoda, Anomura) Institutssymposium Zoologisches Institut Universität Greifswald, Germany. Krieger J, Seefluth F, Sandemann DC, Hansson BS und Harzsch S (2009) Die Gehirnarchitektur von Birgus latro (Anomura) und Gecarcoidea natalis (Brachyura): Beispiele für terrestrische Adaptionen des Geruchssinns. 2. Graduiertenforum Fachgruppe Morphologie der DZG, Greifswald, Germany. Hörnig MK, Rath A-C, Martin I, Harzsch S, Krieger J (2018) Sensing the environment – an atlas of the malacostracan sensory appendages. 111th Annual Meeting of the German Zoological Society, Greifswald. Krieger J, Laidre ME, Hörnig, MK (2018) Shell-use as a tool in the Pacific hermit crab Coenobita compressus H. Milne-Edwards, 1836, 111th Annual Meeting of the German Zoological Society, Greifswald. Kreifelts V and Krieger J (2017) A crustacean invader’s brain - the anatomy of the central nervous system in the Japanese skeleton shrimp Caprella mutica (Malacostraca, Amphipoda), 110th Annual Meeting of the German Zoological Society, Bielefeld, Germany. Haug C, López AI, Hörnig MK, Krieger J, Haug JT (2017) Convergent evolution of raptorial appendages in arthropods. 4th International Congress on Invertebrate Morphology (ICIM4), Moscow, Russion Federation. Kreifelts V and Krieger J (2016) Brain anatomy in the Japanese skeleton shrimp Caprella mutica (Malacostraca, Amphipoda); 109th Annual Meeting of the German Zoological Society, Kiel, Germany. 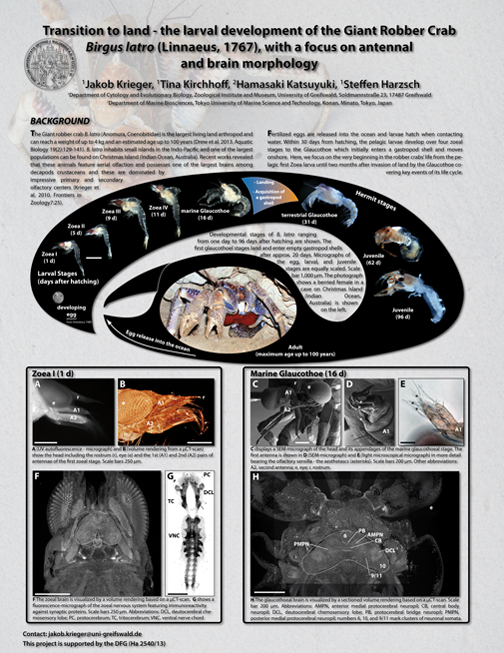 Krieger J, Winter M, Sombke A, Harzsch S (2016) Neuroanatomy in the banded cleaner shrimp (Malacostraca, Stenopodidea) – Structure of mechanosensory neuropils in Stenopus hispidus (Olivier, 1811); 109th Annual Meeting of the German Zoological Society, Kiel, Germany. Rudolf, N.R., Haug, C., Harzsch, S., Krieger, J., Hamasaki, K., Haug, J.T. (2015). Die Metamorphose des Palmendiebes Birgus latro (Decapoda, Coenobitidae). Crustaceologentagung 2015, Bremerhaven. Braun P, Krieger J, Hansson BS, Harzsch S (2014) Structure of the central olfactory pathway in marine versus terrestrial brachyuran crustaceans; 3rd International Congress on Invertebrate Morphology, Berlin, Germany. Krieger J, Grandy R, Drew MM, Erland S, Stensmyr MC, Harzsch S, Hansson BS (2013) Telemetric studies on Birgus latro on Christmas Island; 16. Crustaceologen-Tagung, Greifswald, Germany. Krieger J, Grandy R, Drew MM, Erland S, Stensmyr MC, Harzsch S, Hansson BS (2012) Giant Robber Crabs (Birgus latro) monitored from space: GPS-based telemetric studies on Christmas Island (Indian Ocean); 14th ISBE, Lund, Sweden. Krieger J, Seefluth F, Sandeman RE, Sandeman DC, Hansson BS and Harzsch S (2011) Terrestrial adaptations of olfactory systems – A comparative neuroanatomical study of terrestrial and marine members of the Meiura; 9th Göttingen Meeting of the German Neuroscience Society, Germany / The 9th International Conference and Workshop on Lobster Biology and Management, Bergen, Norway. Harzsch S, Krieger J, Rieger V, Strausfeld NJ, Hansson BS (2011) Transition from marine to terrestrial ecologies: changes in olfactory and tritocerebral neuropils in land-living isopods; 15. Crustaceologen-Tagung, Regensburg, Germany. Seefluth F, Krieger J, Harzsch S (2010) Brain architecture of the European shore crab Carcinus maenas (Linnaeus, 1758); 103. Jahrestagung der DZG, Hamburg, Germany. Seefluth F, Krieger J, Harzsch S (2009) Die Gehirnarchitektur der gemeinen Strandkrabbe (Carcinus maenas). 2. Graduiertenforum Fachgruppe Morphologie der DZG, Greifswald, Germany.